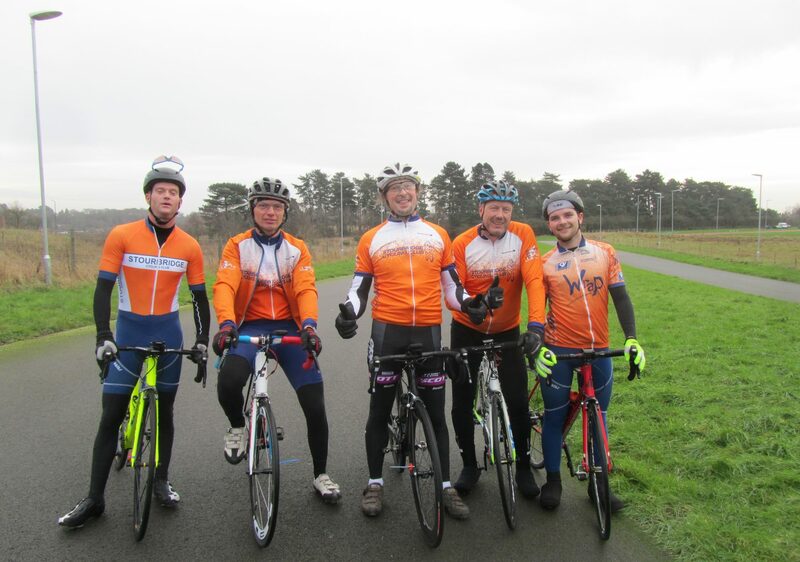 We hold training rides, of varying severity, all year round. If you are new to riding in a group we suggest that, no matter your fitness levels, that you start riding with the “C” or “D” groups. “A” and “B” groups are for experienced riders only. As these are training rides it is unlikely that any ride, other than the “D” group on Saturday, will wait for stragglers. This group meet at Summerhill lay-by, Kingswinford. Route 32 miles approximately 2 hours. Route here. There are currently 4 rides to suit different abilities. Afterwards coffee/tea/drinks in the Summerhill Harvester pub. Meet at Summerhill lay by, Kingswinford. 6.30pm (except the first Tuesday of each month because the club time trial runs instead). 1.5 hours local roads towards Pattingham. Average speed approx 21mph and is higher during the intense part of the ride. Winter training rides: Currently suspended. These are “co-operative training rides” starting at 6:30pm. Approximately 1 and a half hours. Speed is a brisk training pace and not a race. Disruptive riding will not be appreciated! Whilst we try and accommodate as wide a range of abilities as is reasonable, we don’t wait for riders who are really out of their depth. Thursday night: Meet outside Lidl, bottom of Brettle Lane. Start date late October. ALL riders must wear predominantly white or yellow or Stourbridge CC club jerseys – this is for the safety of the whole group and makes us much more visible under sodium street lights. ALL riders must have working lights – 1 powerful front and 2 rear lights in working order (every week someone’s back light fails, this ensures there is always a backup) and a hard shell helmet. Cross training is for anyone who wants to improve their bike handling skills. NEW DAY! This year training will be on a Wednesday night (not Tuesday) starting at the usual time 7.00 pm and finish at about 8.15 pm. NEW VENUE! We are trying a new venue, at Stevens Park, Wollescote DY9 7EY. Please note that the road entrance is off Wollescote Road and we will meet in the car park next to the house. Mountain bikes are fine if you don’t have a cross bike. Before attending a Stourbridge CC ride, please check our “code of conduct” and “preparation for a ride” pages. There are also many reliability trials held locally in January and February which we attend. Please see the news page or Other Rides for details.